Abstract : We present a new, procedural approach for modelling and animating the garments worn by virtual characters. Our method takes into account the properties of fabric to generate the geometry of local folds that are so crucial for visual realism. Modelling is performed by approximating an initial free-form surface roughly representing a garment by a piecewise developable mesh called the buckling mesh. 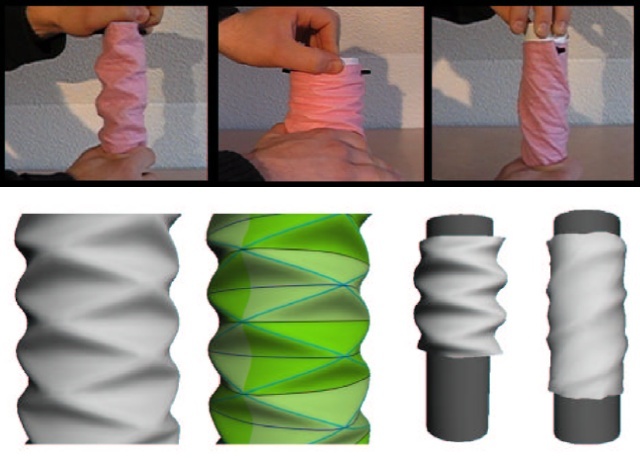 The latter models the specific buckling features of fabric: more precisely, it automatically folds according to pre-computed patterns, depending on the 3D positions of a few control points. The approximation enhances the realism of the garment surface since the wrinkles that make it piecewise developable also give it the appearance of fabric. Moreover, the set of 2D fabric panels required to sew the garment is computed during the process, enabling distortion-free texture mapping. During animation, the buckling mesh procedurally folds and unfolds according to the positions of its control points. The latter are animated through a simple physically-based model that accounts for the floating behaviour of cloth. Our solution differs completely from the standard physically-based approach, since it does not require the use of many mass nodes nor of stiff equations to generate non-extensible cloth. As our results show, our method can be used for the real-time, visually aesthetic animation of dressed characters, making it applicable to enhance the realism of virtual humans in real-time applications.